BEAUTIFUL RENOVATION COMPLETED SUMMER 2018! Thank you for considering our condo for your trip! After you've had a chance to look over this information, I'd be happy to answer any questions you have. Our 2-bedroom, 3-bath condo is located in Copper Mountain’s bustling center village, a quaint pedestrian village complete with first-class retail shopping, restaurants, night life, coffee shops, ice-skating, and more. Copper Mountain, with its 20 lifts and 2400 acres, is considered the most nearly perfect ski mountain in the United States. Copper has something for everyone. Long steep mogul runs and ample above timberline bowl skiing for the more daring and family friendly runs for others, makes Copper a perfect ski mountain. Our condo is right at the heart of it all in the Mountain Plaza! The location could not be any better — right beside the American Eagle lift in Center Village. We are on the sixth floor, providing panoramic views of the slopes and the surrounding mountains. Each bedroom is furnished with two queen-size beds. The living room has a queen-size pull out sofa bed. The condominium has a brand new, well-equipped kitchen with granite counter tops and all-new stainless appliances. You can relax, enjoy the views and warm yourself by the wood-burning fireplace. The condo has three TVs with satellite, high-speed WIFI Internet, and three private ski lockers located just outside the condo door. Our building offers a Starbucks, childcare center, shops, the one of the most popular restaurants in Copper, Ten Mile Tavern. There are also indoor and outdoor hot tubs, two elevators, and coin-operated washers and dryers in the building. Copper Mountain offers a wonderful (and free!) bus shuttle around the entire resort and one of the stops is just outside out building. Each rental come with a free parking pass for the enclosed and secure parking garage. The condo will be furnished with bed linens for eight, towels for nine, one dish cloth, one dish towel, and limited amounts of toilet paper, paper towels, and soap. If you will be staying for an extended period, you may want to bring some things with you. * We accept Checks, VISA, MasterCard and AMEX. * Add 6.375% Tax and $175.00 cleaning fee. * Upon booking, a downpayment of $100 is required. Balance is due one month prior to arrival date. weeks before arrival no refund is offered. * EIGHT IS THE MAXIMUM NUMBER OF GUESTS ALLOWED. Hi! We are Shawn and Shawn Murdock. That's not a typo; both of our first names are Shawn. We live in Northern Kentucky, just across the river from Cincinnati. We have been married for 28 years and have three wonderful children. We fell in love with snow skiing, and Colorado in particular, during our first trip there in 1988. We love Copper Mountain not only for its amazing skiing for all skill levels, but also because its proximity to Denver and I-70 make it super easy to get to. We can catch a direct flight to Denver in the morning and be skiing that afternoon. When we finally decided to buy a ski place, we chose this particular condo because of the sheer convenience of being right in the middle of the action and only a few steps away from the lifts. It's the perfect location for families who need quick and easy access to the condo during a ski day. Need a quick break? Just ski right to the building and take the elevator right to the condo door. And when some in your party are ready to call it a day, they can watch all the action on the slopes from the enclosed patio. 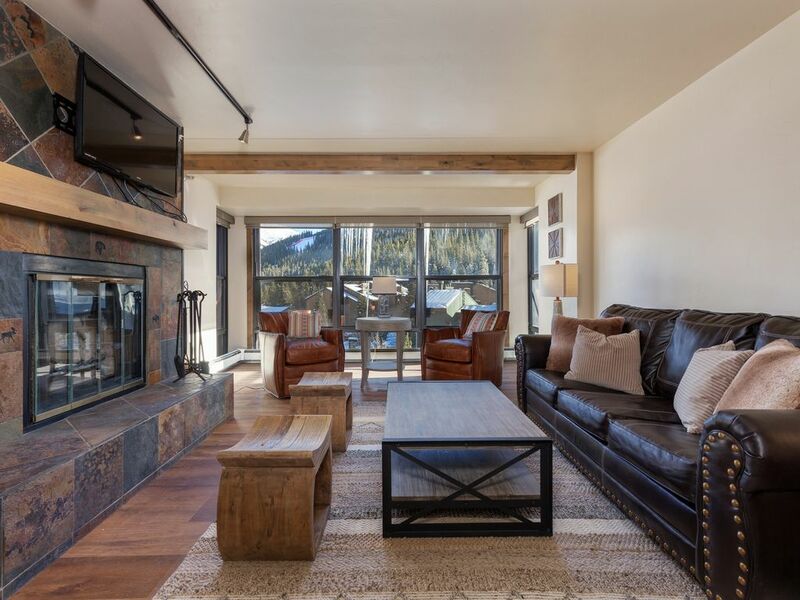 And when you're ready to explore beyond Copper Mountain, the condo is centrally located for quick trips to Frisco (5 miles), Vail (18 miles), Breckenridge (19 miles), and Silverthorne for shopping and movies (13 miles). toilet, combination tub/shower, Newly renovated! Shared, coin-operated machines located in building. One car in building parking garage. Additional parking in beside building. Elevator doors open right in front of condo door. We've stayed at this condo for the past few years.. great new remodel this past summer. The ski in/ski out convenience and view is a nice perk. We also liked the map of the mountain on the wall near the dinner table, as we spent time while eating meals discussing what runs to do next. Thank you again for the great accommodations - we'll be back! Great location and great condo. The location is great for skiing! Just steps to the lift. Right in the middle of all the restaurants and shops in central village. Condo is updated with plenty of beds and the third bathroom was great to have. Condo was very clean and well stocked. Nicely appointed condo located perfectly beside the lifts and in the center of the resort. Fantastic condo and great location for skiing. Check in was simple. We loved the location and the condo had everything we needed and more! Lovely condo that is comfortable/nicely furnished, Convenient location. Attentive management/owners. This is a terrific place. Plenty of room and beautiful views. We were truly comfortable/at home. We really appreciated the humidifiers, as it greatly helps in our altitude adjustment/comfort. The owner was responsive, welcoming, and easy to work with. The management was friendly, and promptly helped with the couple (minor) things that came up. Location! Location! You are right there at the base of the new gondola (Eagle Lift), just steps away. It made for an quick, un-harried start of the day, ski in/out for lunch, and easy stroll "home" on the final run. [The ski lockers just outside the door in the hall was super convenient. Besides skiing... having Starbucks right downstairs w/o going outside was rather nice. Also in-building on the ground floor is 10-Mile Tavern - great beer selection, and wonderful food. To sum up: definitely hope to rent this unit again! We stayed for 4 nights in Feb. and loved your condo. The location and convenience of staying at the base of Copper Mountain made our trip so much more enjoyable. It was great to have ski lockers in the hallway right outside the condo (no more freezing cold ski boots left in a cold car all night!) and it was wonderful to be able to walk to the ski lift in less than 5 minutes. We were very pleased with the accommodations and having 3 full size bathrooms was a plus for a family of 5 adults. We were grateful to have 2 large hot tubs to relax in after a long, cold day of skiing. We highly recommend this condo to others looking for nice accommodations and a great location. We would definitely stay here again.